I’ve lived in Northern Wisconsin for 30 years and the only month where I’ve never seen frost is July — but I’ve heard it can happen. My growing season for tender plants like Japanese indigo is generally from early June to mid-September. This year, I’m trying to extend that season on the front end. I’m hoping I won’t have to bring potted plants indoors in the fall to protect them from frost while seeds mature for the next year’s crop. 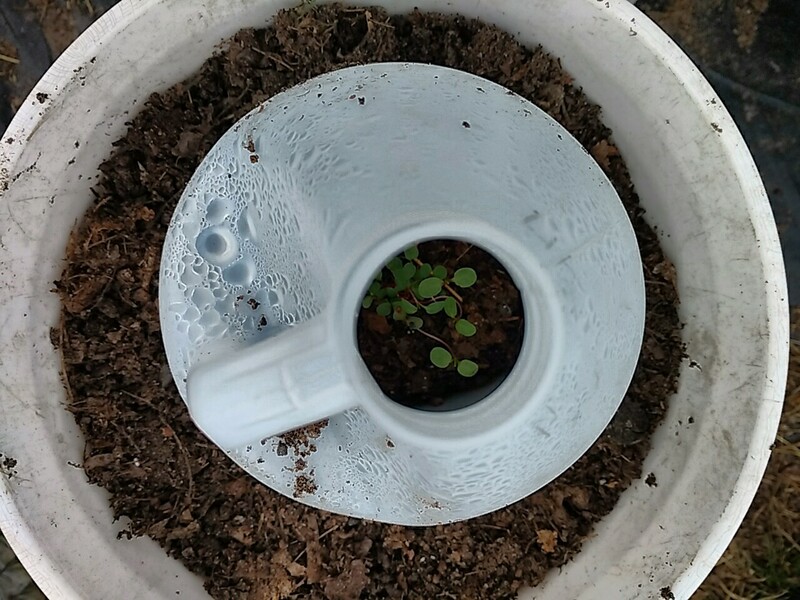 Previously, I started my indigo seeds at the end of April and set the plants out under milk jug cloches after Memorial Day. Our ground can stay cold well into June, and the cloches act like mini greenhouses. This year, though, I started seeds in early April, and set the seedlings out under cloches on April 24. We’re expecting overnight temperatures in the high 20s later this week, which might put a quick end to this experiment. 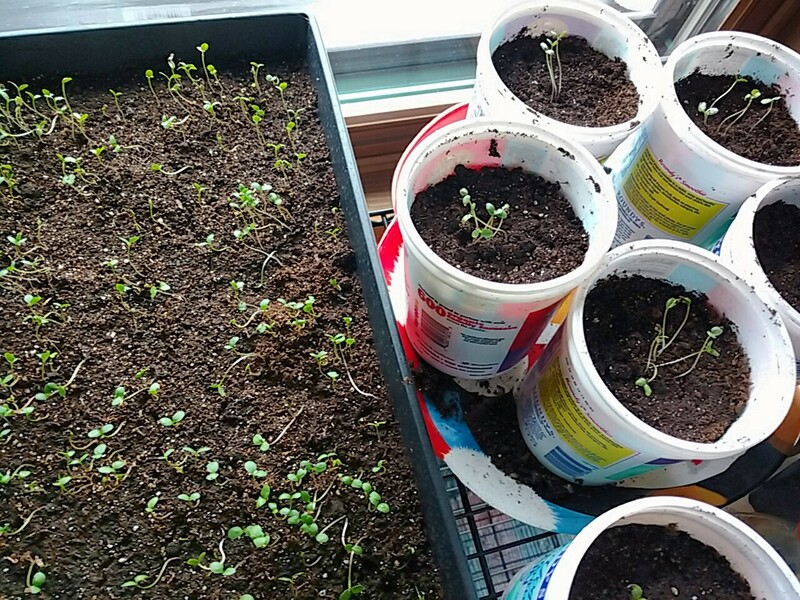 To be safe, I have more seedlings indoors and can replant if necessary. This is the first time I’ve used a heat mat under the flat while germinating the seeds. In the past, I put containers on top of our 55 gallon aquarium. Without the aquarium for warmth, I splurged on a $17 heat mat that I only used for a couple of days. I don’t have grow lights, so my seedlings get leggy pretty fast. 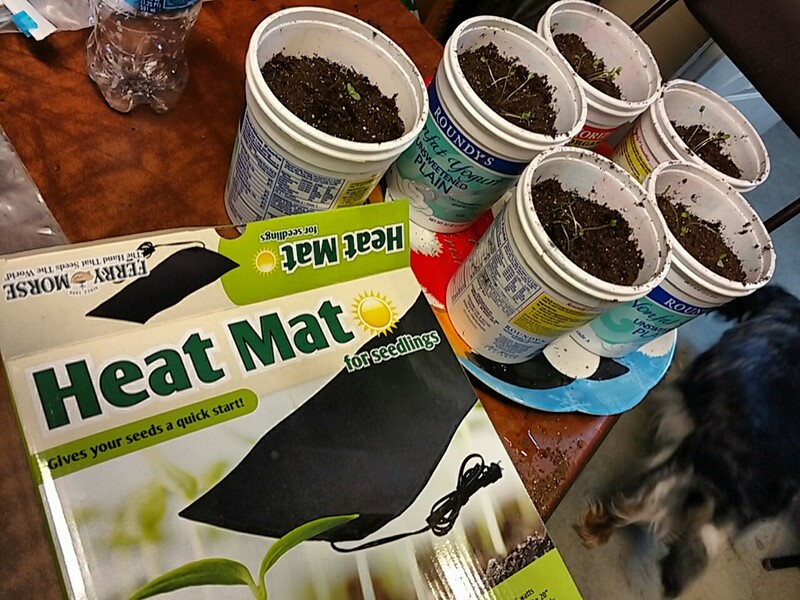 On April 20, I transferred some seedlings into yogurt containers. That should give them enough soil to thrive in case they’re indoors another four to six weeks. These are my insurance policy, in case this experiment in pushing the season fails. If the seedlings that went outside already do succumb to frost this week, I have seedlings left in the flat for replanting — several times, if necessary. But I have high hopes for this experiment. I’ll keep you posted.